1. All Past Due Accounts shall bear and Buyer agrees to pay a service charge of 1.5% per month from the due date. 2. Basis of Sales-Invoice: All materials and goods shall be invoiced in accordance with Seaport Steel's schedule of weights, areas, size and lengths, and all weighing will be by theoretical weight of ASTM, which shall govern all settlements. 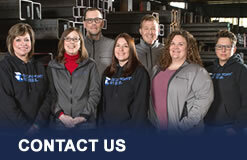 All quotations, oral and written, are subject to prior sale unless otherwise specified in writing by Seaport Steel. 3. Shipments and Payments: All shipments and deliveries shall be at all times subject to the approval of Seaport's Credit Department. If Applicant fails to make any payment according to terms, if Applicant defaults in performance of any other obligation in Seaport, or if Applicant is discovered to be insolvent, Seaport may, at its option, and in addition to any and all other rights and remedies available under law or under other agreements, cancel any contract with Applicant, cease manufacturing or refuse shipments hereunder, stop delivery of any goods in transit; reclaim any goods for which payment has not been made; and exercise all other rights provided by the Uniform Commercial Code and laws of the State of Washington. 4. Delays and Deliveries: Seaport shall under no circumstances be responsible or liable for failure to fill any order or orders when due to: fires, floods, riots, strikes, mill shortages, freight embargos or transportation delays, shortages of labor, fuel or power. Inability to accrue materials or supplies at current prices or on account of shortages therof, acts of God or the public enemy, any existing or future laws or sets of federal or of state government affecting the conduct of business or due to any other cause beyond Seaport's reasonable control, whether or not affecting the procurement, production, or transportation of the particular order. 5. Title: - Risk of Loss: Risk of loss or damage to goods and materials shall be upon Applicant upon delivery by Seaport Steel to the carrier. F.O.B. shipping point. 6. Security Agreement: To secure payment and performance of all of Applicant's current and future obligations to Seaport, Applicant hereby grants to Seaport a security interest in all inventory and goods that Applicant has purchased or at any time in the future purchases from Seaport. A copy of this security agreement may be filed as a financing statement. In which case Applicant is the debtor and Seaport is the secured party. 7. Inspection-Claims: Applicant agrees to thoroughly and carefully inspect all material and shipping papers promptly upon delivery. No claim of shortage or damaged material will be valid or enforceable against Seaport unless written notice specifying in detail the nature and extent of such shortage or damage is mailed to Seaport within five (5) days from the date of delivery accompanied by original freight bill, with notation on the face thereof by the authorized agent of the carrier as to the items and quantities claimed to be short or damaged. SEAPORT WILL NOT BE LIABLE FOR ANY LOST PROFITS OR ANY INCIDENTAL OR CONSEQUENTIAL DAMAGES OF ANY TYPE OR NATURE BY REASON OF ANY SUCH SHORTAGE OR DAMAGEDMATERIALS. 8. Limited Warranty: Seaport warrants only to the original purchaser that the materials and goods shipped under any order conform to the description on the face therof, subject to and variations consistent with usual and customary trade practices, and warrants title, the description on the face thereof, subject to and variations consistent with usual and customary trade practices, and warrants title. Except for title, there are no warranties which extend beyond the description in respect to the materials. AND THE ABOVE WARRANTY IS EXPRESSLY MADE IN LIEU OF ANY AND ALL OTHER WARRANTIES, EXPRESS OR IMPLIED, OR STATUTORY, INCLUDING THE WARRANTIES OF MERCHANTIBILITY AND FITNESS FOR A PARTICULAR PURPOSE OR USE, AND NO EXPRESS OR IMPLIED WARRANTIES EXCEPT AS ABOVE STATED SHALL APPLY TO GOODS OR MATERIALS SOLD BY SEAPORT UNLESS EXPRESSLY MADE IN WRITING AND SIGNED BY AN EXECUTIVE OFFICER OF SEAPORT. Should any items supplied by Seaport fail to conform to the description, SEAPORT'S LIABILITY SHALL BE LIMITED TO REPAIR OR REPLACEMENT OF THE ITEMS OR REFUND OF THE PURCHASE PRICE, at Seaport's option and then only if:(1) Applicant gives Seaport written notice specifying in detail the nonconformity or defect within ten (10) days from the date of delivery;(2) Seaport inspectors, at Seaport's warehouse determine that the items in fact are nonconforming or defective; (3) Applicant within ten (10) days after request returns items to Seaport's warehouse; and (4) terms of payment have been fully met. THE FORGOING SHALL BE APPLICANT'S SOLE AND EXCLUSIVE REMEDY, WHETHER IN CONTRACT, TORT, OR OTHERWISE, AND SEAPORT SHALL NOT IN ANY EVENT BE LIABLE FOR LOST PROFITS, LOSS OR DAMAGE ARISING OUT OF THE USE OF OR THE INABILITY TO USE ANY GOODS PROVIDED BY SEAPORT OR FOR ANY INCIDENTAL OR CONSEQUENTIAL DAMAGES OF ANY TYPES OR NATURE. 9. Terms: All prices quoted by Seaport are exclusive of all city, state, and federal excise taxes, including, but without limitation, taxes on manufacture, sales, receipts, gross income, occupation, use and similar taxes. 10. Remedies: All purchases from Seaport shall be governed by the Uniform Commercial Code of the State of Washington and all rights and remedies of the parties shall be governed in accordance with the laws of the state of Washington. 11. Agreement of Sale: Any of the terms and provisions of any order by Applicant which are inconsistent with the terms and provisions hereof shall not be binding on Seaport and shall not be considered applicable to the sale or shipment of any items by Seaport unless expressly agreed to in writing by an executive officer of Seaport. 12. Commercial Credit: Seaport does not extend credit on a consumer non-business basis. Applicant hereby warrants that all purchases made from Seaport for which credit is extended will be used solely for commercial purposes in the furtherance of a business. 13. No Waiver: None of the forgoing terms and conditions shall be deemed to have been waived unless waiver shall be set forth in writing signed by an executive Officer of Seaport. The forgoing terms and conditions shall not be subject to modifications or waiver by course of performance, course of dealing, or usage of trade. 14. Returned Merchandise: All merchandise returned is subject to a 20% re-stocking charge.